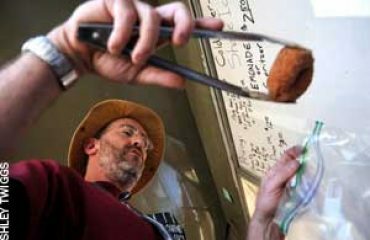 Matt Rohdie and his wife, Jen Downey, have been making from-scratch organic donuts since 2007, offering their delectable treats to customers in and around Charlottesville. Traveling to local fairs, concerts, and other events in their mobile donut truck, called Gypsy, Rohdie and Downey strive to create a sublime donut- eating experience for their customers. The donuts are made with local apple cider, and used frying oil is converted into biofuel. Carpe Donut recently expanded to a storefront location in Charlottesville, and the owners are working toward a contract with 26 Whole Foods stores throughout the mid-Atlantic region. Soon, these delicious confections will be available to donut lovers up and down the East Coast.